Once attributed to movement on the South Island’s Wairau Fault, the earthquake is now thought to have been the result of movement on the nearby Awatere Fault. The main shock was felt most severely in the Wairau Valley and in Cloudy Bay, where the shaking demolished houses and fissures broke the ground. Wellington and Nelson also suffered significant damage to structures and buildings from these earthquakes. The main shock was felt strongly as far away as the East Cape, northern Taranaki, and Banks Peninsula but, like the other quakes in the swarm, it was experienced most severely in the centre of the country. The lower Wairau Valley bore the brunt of its force, experiencing intensities of MM 10, while intensities of MM 9 destroyed a number of cob houses in both the Waihopai and lower Awatere Valleys. The earthquake also greatly disturbed the surrounding landscape, triggering numerous landslides in the hills and rupturing the ground over a distance of more than 105 km along the Awatere Fault itself. In Wellington the severity of the shaking (MM 8) caused extensive damage, while in Nelson, Whanganui, and Manawatu the intensities reached MM 7. The earthquake triggered landslides along the south-east coast of the Wairarapa and in the Rimutaka ranges. 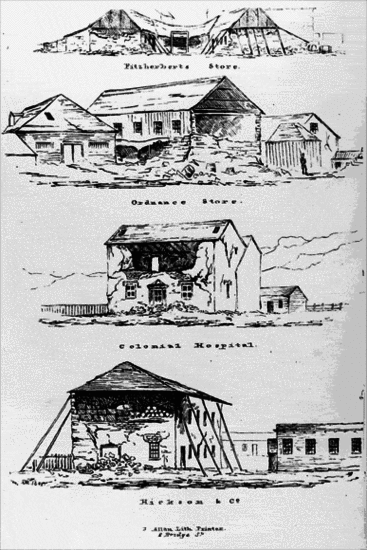 Most of the houses in the Wairarapa suffered chimney damage, and at least one was shifted from its piles by the ground movement. The occurrence of landslides and groundwater ejection were unusually widespread in this earthquake; it is possible that this was due to the period of extremely wet and stormy weather that preceded the quake. The earthquake was followed by a long series of aftershocks. The largest struck one day after the principal shock, at 4 o’clock in the afternoon on Tuesday, 17 October (New Zealand Local Time), and killed three people. Although the shock was smaller than its predecessor, with a magnitude ML 6.1, it caused significant damage because a number of structures had been left severely weakened by the 16 October earthquake.